Hello lovelies, here I am back with another review as promised. I actually have been trying a lot of new launches for last couple of months and thus there is a delay in posting. 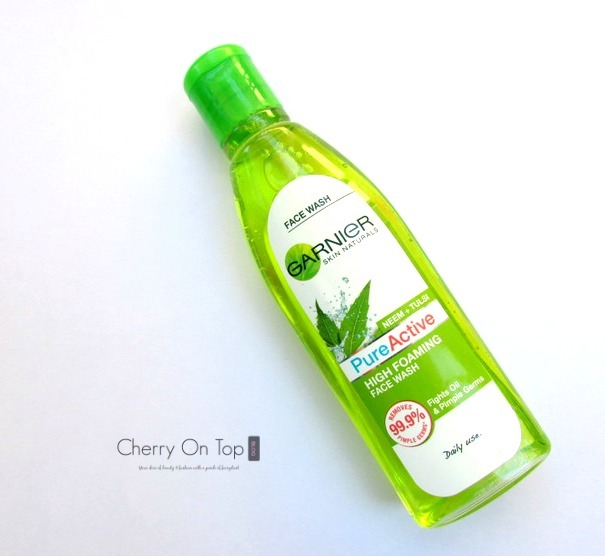 Last month Garnier had launched another facial skincare product which is included in their Pure Active range. This is the High Foaming face wash. Garnier say that this product has the benefits of two commonly used Indian herbs- Neem and Tulsi (basil). Today, I will be sharing my experience with this product. If you follow me on Instagram (@cherryontopblog), you must have seen a picture of the product. I have been using it since then. I think it has been almost a month since I started using it. I am now ready to deliver my views. So, let’s jump into it! Packaging- The first thing I liked about this product is its fresh packaging. It comes in a clear bottle with a regular flip cap. The packaging is sturdy, totally spill-proof so can be traveled with. The transparent bottle allows you to keep checking how much product you are left with. That’s a good thing for me. Product- The product is a green coloured gel-based foaming cleanser. The consistency is slightly runny. It lathers a lot thus it is true to its claim of being a high foaming face wash.
My thoughts- I wash my face with this face wash thrice a day. 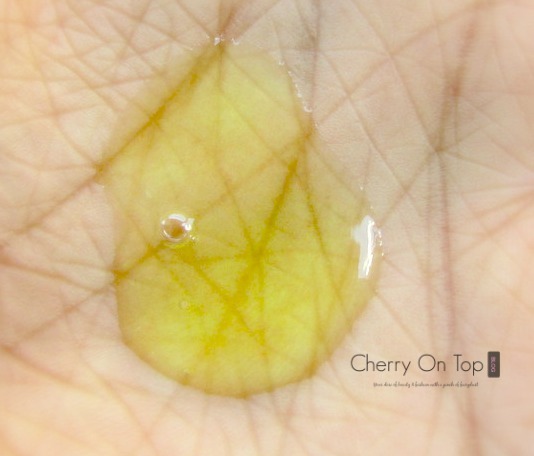 I normally take two drops on my palm and apply it directly on to the skin. Only two drops are adequate for my face and neck. I like to rub this product on my skin for 10-15 seconds to form the lather (not that it requires that much of time, it is just that like too much lather on my face). The great thing about this face wash is despite being a high foaming cleanser, it doesn’t dry out your skin. I have used foaming cleansers in the past and they used to leave my skin with a stretchy feeling after every use. 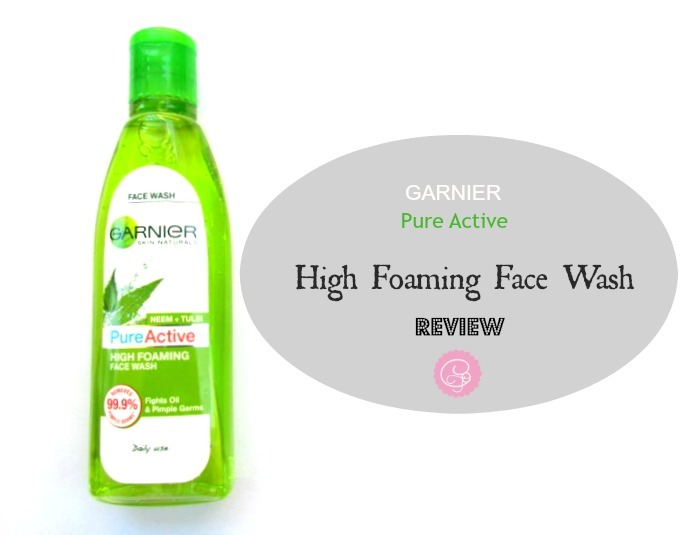 Garnier Pure Active High Foaming face wash is nothing like them. It rather replenishes the skin giving a natural glow to it. Every time I use this face wash I feel my skin is oil-free but not dehydrated. It makes my face soft and supple. Another thing is that it takes off all the oil from my skin (I have extremely oily t-zone) thus leaving it healthy and fresh. I don not have acne-prone skin so I can’t make a remark on that part. I can say that this product has not caused me any breakout so far. Overall, I am totally in love with this product. This is one of my HG skincare products now. Being a gel cleanser, it suits oily to combination skin perfectly. The price is within budget. I did not find a single reason to dislike this product. So far I am happy with this product. That’s all, people! I hope you found this review helpful. Have anyone of you used this? I would love to know your views too. If you liked this post then don’t forget to share with your friends. Hope to follow my new blogging schedule. I will be here with a new post soon. Till then be safe & keep smiling! Disclaimer: PR sample but honest review.